One of the earliest things I will tell my students once they’ve started learning/teaching their dog how to wrap an object is to “go play with trees”. Usually I get a few odd looks at this point, but trust me on this. Using trees is a great agility-free way to practise agility. There’s no real agility obstacles and you can achieve so much. 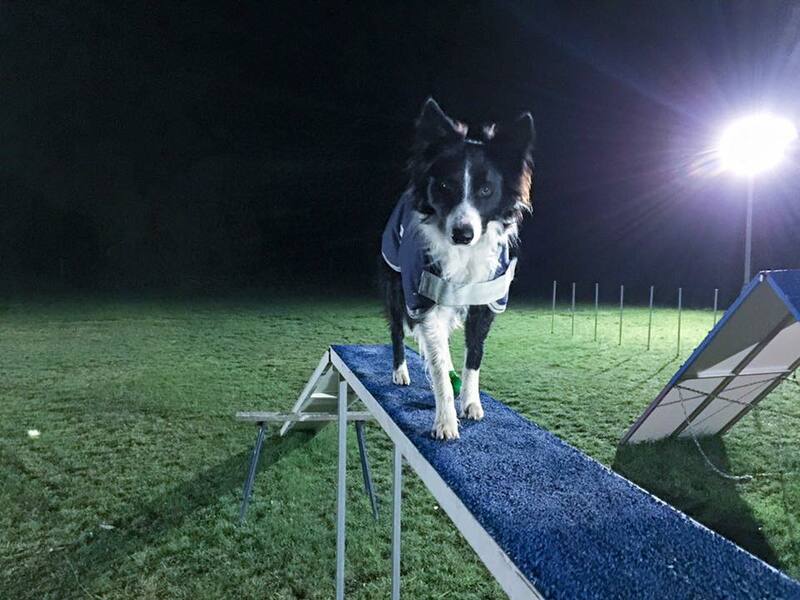 Let me see: improve handling, increase commitment, practise tight turns, increase independence, increase obstacle focus, increase handler focus, practise moves you find tricky, work on agility sequences with a more ‘low stress on the body’ option than jumping. Even young dogs can play this game. Too much won’t be good for them (too much of anything isn’t good for them) but it’s certainly better than jumping them or introducing them to ‘real equipment’ before they’re ready! As you’ll see in the video below, I’m doing heaps of handling options with Loki – wraps and front crosses, blind crosses, lap-turns, threadles and probably more. I’m testing to see how far he’ll send (independence) and how soon I can move onto the next obstacle (commitment). I’m improving my handling after I make a mistake that causes him to pull off the tree – I try again and we succeed this time. If you’re new to agility and can’t really tell what’s going on, you can slow down the video to 25% – click the cog down the bottom right and select 25%. Then, even if you’re not 100% sure what’s happening, you can watch my body language and how Loki responds, see when I’m taking off, see the ways I’m using my body. And no, my handling is not perfect – I wouldn’t ever claim it is! Especially in this scenario where I’m making the ‘course’ up as I go. But it’s a bit of fun and makes my brain have to think fast in order to direct him properly. The title of this post sort of sounds like I have a drug-addicted dog. Which I suppose could be a thing, given the assortment of dog valium and the like around. But that’s not what it’s about. Recently Loki, my working-line border collie, managed to run over a piece of metal stuck in the ground while I was at work. 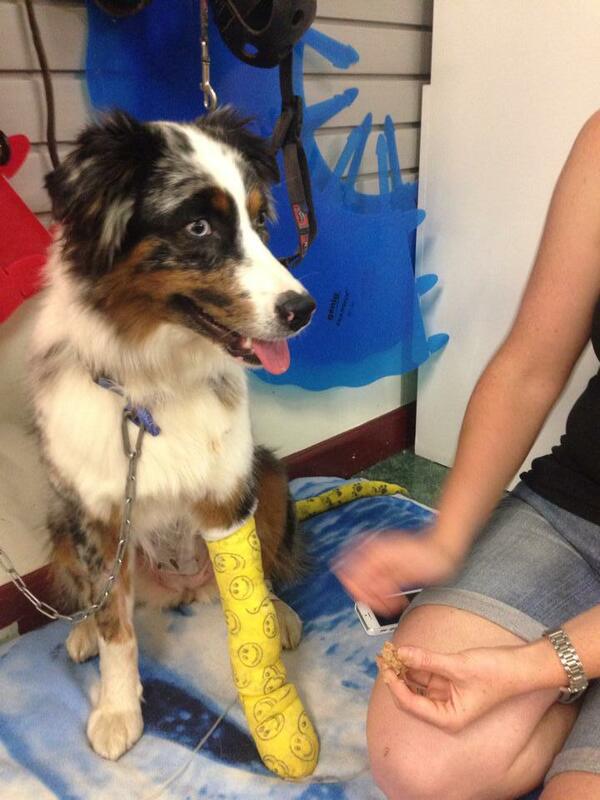 He gouged a chunk of skin off his toe pad. As a result, he has been bandaged up and restricted to crate rest and light walks for the last week and a bit. 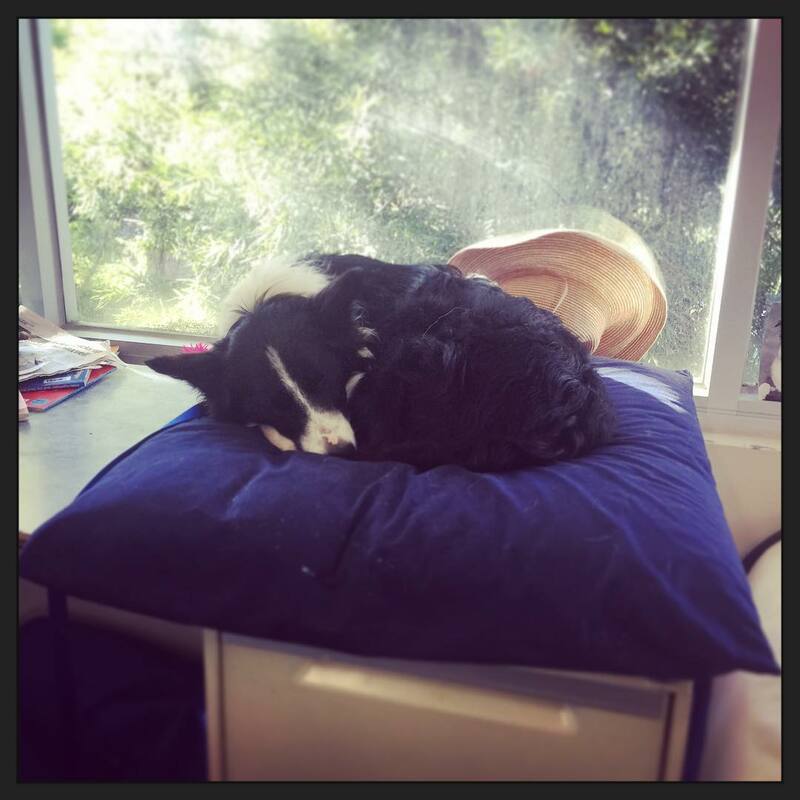 So if you find yourself with an injured or sick dog (and this is not my first stint at having a high-energy dog on restricted activities – thanks Lumen) what can you do? Even I’m suffering with Loki’s lack of exercise so if you haven’t been through this experience before, I can imagine you would quick be at the ‘pull your hair out of your head’ stage. Poor, sick Lumen. One morning she vomitted blood. By the afternoon she was having her stomach opened for an exploratory surgery that found ulcers bleeding into her stomach and hugely swollen lymph nodes. Here’s what I do, and of course, this all depends on WHY your dog is on restricted activities. Obviously you would treat different injuries and illnesses with different cares. A leg injury would need to avoid much movement altogether, where Lumen’s stomach surgery gave us a bit more freedom in that respect. Always check with your vet as to what is appropriate for your dog. Crate train. Oh, if I could not put either one of my dogs in the crate when they wanted to have mad wrestle sessions, life would be so much more difficult. Instead, I put them in their crate, they lie down quietly, look around, and then usually fall asleep. Nobody complains about being in there. If I had to go out for the day I would be ok leaving them in there if they were on serious crate rest. As it is, I take Loki to school with me because sleeps all day there tethered on a long line in the office. Basically just a big crate with occasional visitors. Yes, she looks VERY unhappy here but it’s because her stomach was shaved for her operation and she is a very sensory dog and all she wanted to do was lay on very soft things and never come out. Kongs and food dispensing toys. These are your friends. Big time. Your dog will probably put on weight. Their life will probably revolve around eating in some way or another, and sleeping. This is ok. But don’t waste those precious calories through feeding in a bowl. Use food as a way to exercise your dogs’ brain. I stuff Kongs with BARF or raw meat, sometimes with a dry biscuit in the middle to take up space, and then I freeze them. This way they get some of their meal at the same time as working hard to eat. There’s heaps of ways to stuff a kong but this is the easiest way for me because, let’s face it, I’m lazy. We also have a selection of food dispensing toys. I think my favourites are the Kong Genius range. We got a few in the medium size (for our Aussies/BCs) and hooked them together and that took them a little while to figure out, but they have the technique down now. Recently we bought two Kong Geniuses in the ‘small’ size because the hole to get the biscuits out is smaller. This is providing them with much more of a challenge, and they get less food in one hit. Bonus. Tricks/training. Shaping tricks is EXCELLENT mental exercise and there is a huge range of tricks you can teach to suit any injury or illness. While Lumen was recovering from her stomach surgery, I taught her to limp with one leg and probably others that I can’t remember right now. With Loki’s paw, I’ve been working on his ‘sit pretty’, ‘throw a towel over your head’, ‘DJ shuffle’, lifting front legs one at a time and so on. None of these involve movements that will aggravate his paw. Involve your dog. I don’t know about you but if my husband and I are out and about on our property, gardening or planting things, or doing maintenance, and our dogs are just snuffling around hanging out with us, they go inside and crash. Depending on why your dog is on rest, you could tether him outside with you while you do things or let him wander around if he’s calm and that’s appropriate. Similarly, if we have guests over, our dogs tend to be so excited to have visitors that they sleep very well when the guests leave. Maybe you could have a “get well soon!” party for your dog! Go places. Similar to above and, as always, dependant on what’s wrong with your dog, you might be able to take them out to weekend markets or other stimulating environments (the other day we hit up two pet stores and a vet with Loki) to give them some much needed mental enrichment and a break from your house. This is appropriate for both Loki’s paw as the vet informed us he’s allowed to go for walks, and would have been fine for Lumen’s stomach a couple of weeks after her surgery. You can treat your dog like a puppy and go on a socialising tour of busy places. If they have a fancy and visible bandage, they might even get sympathy pats!! Loki is very lucky as he is allowed to come to school with me while I teach. He is so calm there and will sleep the majority of the day away, sometimes on top of the filing cabinet. This also lets me stress less because I don’t have to worry if he’s at home chewing off his bandage. This post is written having trained a less motivated, less drivey dog. It is written having now trained a high drive dog, and being conscious of how precious that confidence is in order to keep up his speed and motivation. I felt for some reason that I needed a disclaimer here, but I’m not sure why. The other weekend I was at a seminar. The seminar was great, and Loki was amazing. Sometimes I wasn’t so amazing, sometimes Loki didn’t know what I was asking, sometimes I asked him to do the wrong thing, or I was ambiguous in what I was asking. Pretty much every time we ground to a halt (and it was often) I rewarded him. The image above was taken after we messed something up – I’m grinning and Loki is about to get his toy. I remember last year at a OneMind Dogs seminar, the presenter, Noora, was very big on people rewarding their dogs. I found my notes from the seminar where I wrote: “There are no wrong obstacles. She should be able to take the first obstacle she sees & that’s right. Saying otherwise will diminish speed. Need to do another obstacle (after the one she did wrong) and then reward.” I think I picked up her mantra in a way, and the philosophy that pretty much nothing is the dog’s fault – it is either your fault for not handling quite right, or because you haven’t trained something. The dog doesn’t set out to do the wrong thing – why would he? He’s not malicious, or hoping to humiliate you, or wanting to NOT get his toy or food! Silvia has a very similar philosophy: train for full speed first, fix mistakes later. And yet… whenever I train in a group situation, I am very quietly wondering why people don’t reward their dogs. Today I went to a local training club and watched a woman run a whippet. My understanding is that whippets need motivation to work – they’re not like BCs that just live to work. Loki & his brothers would probably be just as happy to do agility and, as a reward, get to do MORE AGILITY!! This woman ran around with her whippet and then cued the wrong turn, so the whippet took the wrong jump. She sort of sighed at herself, went back a few obstacles and tried again. Once again, she did the wrong cue and the whippet followed her instructions and didn’t do what she wanted it to do. She knew that she had done the wrong cue, but sighed again and said something like: “I’m all messed up. I give up.” and walked off. The whippet trotted happily at her side with a big grin and I thought how lucky she was that that was his reaction. If I’d done that to Lu, you can bet she would have gone and found something to sniff, a dog to meet, or would have been slow the next run, and it would have added one more “agility is not fun” notch to her little belt. Even at the seminar on the weekend, people would mess up, get tangled in their feet, forget what cue they were meant to be doing and just stop. The dog is bouncing around at their feet going: “did I do good!? Did I!? Hello? !” and they’re talking to the instructor. If I fail, or if Loki fails, or hey, if we both fail (it happens) – he gets his toy. I play tug and either listen to the instructor while he pulls my arms off, or he takes his ball to the edge of the area while I talk or re-walk that section to focus on my cues, then we have another go. So, aren’t you rewarding mistakes? Well, yes. But I’m not worried about it. I’m not worried because in Loki’s eyes, he rarely does ‘wrong’. This lets him feel like he’s so smart and can make no mistakes and therefore, he can go as fast as he can. I’m not worried because when he gets it right, we either have a big party right then (which looks and sounds WAY different than “here’s your ball cos we stopped”) or we get to keep going – both are good options for Loki. I’m not worried because I know that he’s (generally) doing exactly what I’m telling him and therefore, he’s a very good boy. 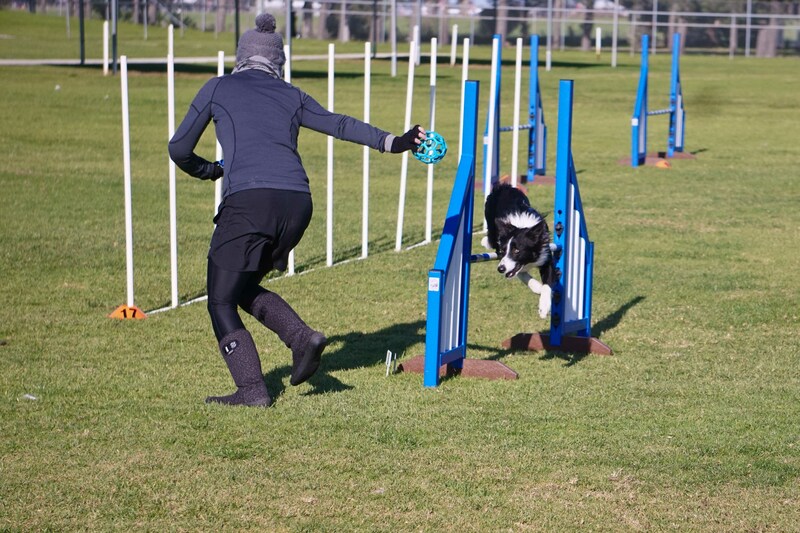 Sometimes I can tell he’s patterned to a sequence – for people new to agility, this means he’s done the course a couple of times and could basically run it regardless of what I’m doing with my body. He starts to ignore me. If he makes mistakes because he’s patterned to doing it the ‘wrong’ way (maybe I cued him wrong 3 times in a row now he thinks it’s that way) then I have to break it down into small pieces for him so he can succeed, and I reward those successes. Loki is never out to be wrong, and I don’t let him think he is wrong. Similarly with any obstacle training (weaves, dogwalk, seesaw), I will try and keep the rate of success high, or I will change the setup so he can succeed. Depending on what the obstacle is, I may change or lower my criteria until he has a better understanding and then jackpot the best attempts (for example, with a running A-frame – I may reward high hits in the contact area and/or continue with the course, but will stop to jackpot nice deep hits that he finds challenging. I don’t expect those hits every time, but my expectations are realistic enough that he can succeed almost every time. Sometimes he doesn’t hit – it’s ok for him to fail in this circumstance so he can learn what does and doesn’t work, and here I won’t reward him – instead, I might use a non-reward marker like “oops!” and go back to that obstacle and try again. If he gets it right – reward!). I love how much Loki loves to work. It’s a precious gift after a hard-to-motivate-dog like Lumen, and I am VERY conscious not to squander it. I recognise that most of the mistakes we make on a course are mine (though bars down can be an exception (though still sometimes my fault!)) and will either ignore the mistake & keep going, or stop, give him his toy, and start again. How do you reward your dog? Is it often enough? Have you thought about it before? What do you do when you mess up and need to talk to the instructor? 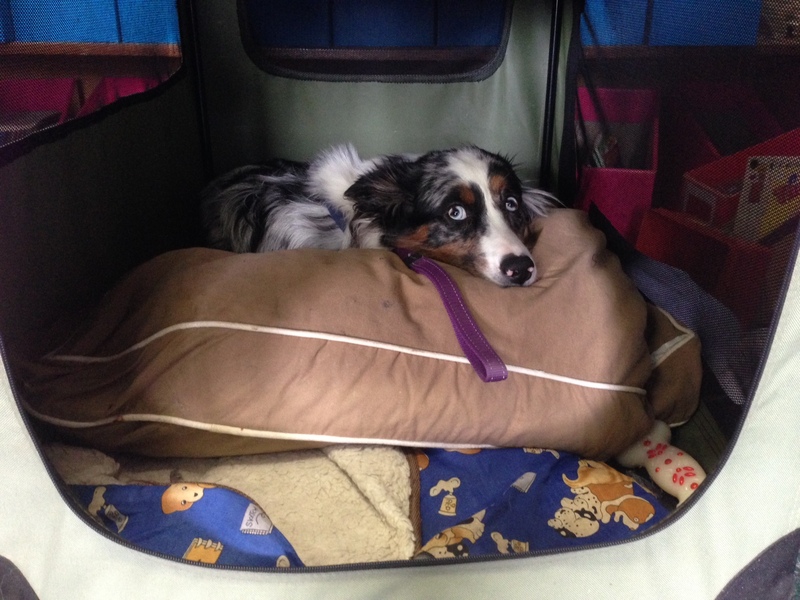 How do you keep your dog feeling confident and happy even when everything falls apart? Welcome to a new series of blog-posts, as requested by my students. Over the next few weeks I will try and cover how to train some basic tricks that are also handy for agility. These will include bow, beg, stand tall, leg-weaves, “bang”/roll-over, frog, spins, paw-target (front and back), pivot, 4-in, skateboard, back up, cupboard slam and more. If there’s something you’d like to see particularly, please comment here! Don’t forget to subscribe so you don’t miss anything. It’s very hard to get video of my dogs learning something from scratch – particularly basic tricks, as they already know them all! So I’ve tried to explain how I would get to the point you can see in the videos, and use all 3 of my dogs to demonstrate different levels of understanding. To begin this trick your dog needs to understand the basic concept of shaping. If you’re not sure what this is, go and read my blog post and check back here after that. Your dog should be pretty keen to problem solve & offer behaviours. To begin this trick your dog needs to understand the basic concept of shaping. If you’re not sure what this is, go and read my blog post and check back here after that. Your dog should be pretty keen to interact with any object you put in front of it. Welcome to another episode of Agility tips & tricks. One of the first things I get my students to do, and one of the staple elements of my Foundations class is shaping. This is, using the clicker to mark an action of the dog in order to build a behaviour. To do this, we ‘shape’ approximate steps toward the final product and reward those steps and jackpot the steps which are closest to what we’re looking for. Sometimes starting this with a dog who isn’t familiar with clicker-training can be a little frustrating because you don’t see anything ‘happening’. Sometimes starting this with an owner who isn’t familiar with clicker-training can be interesting because they feel they have to show or tell the dog what to do all the time, rather than letting the dog work it out. What we want in shaping is for our dogs to give us a bunch of different behaviours, without a cue or a prompt, and for us to say, “YES! That was what I was looking for!” (which is what the click does), or, for us to say nothing much at all if we need to wait for what we want. When we start shaping, we want our dogs to feel like anything they do is awesome and that they are the smartest dog in the world. I’ve found that the best way to begin shaping is with an object or even a few objects on the ground. You can shape without any props but I think it’s easiest to start with something them for interact with. I usually sit on the floor with my dogs for my shaping session. It helps shift their focus to lower which is usually where the objects are. Obviously if I want them to stand on my feet or jump on me, or on the couch or something, I’ll change my body position. One of the best objects to start with is a simple cardboard box.You’ll need this, your clicker, and a bowl of food. Sit on the floor, have the bowl of food behind or beside you (if your dog wants to mug the bowl, we can work on this later, but usually the ‘game’ is much more fun, and they love working for their food. ), have your clicker in hand, and get your dog in front of you. Drop the box on the floor in front of you. Usually this will cause the dog to look at the box so BE READY! When the dog looks at the box, click and reward (C&R). Sometimes it helps to drop the food in the box at this early stage. Then wait. If the dog glances at the box, sniffs the box, moves toward the box, C&R. If the dog does anything purposeful in regards to the box (sticks their face or feet in, nudges it with their nose), have a huge reward party. Continue like this. If you continually click the one behaviour (eg. glancing at the box), then this is the only behaviour you will get. So, sometimes you need to wait. If your dog is glancing at the box, start waiting him out, he’ll probably glance, glance, glance, glance… pause and look at you quizzically, and then hopefully, lower his head to the box, or step toward the box. Have a big party for this new behaviour. Eventually you want your dog to start trying lots of things. It’s fantastic game for rainy days – 101 things with a box. With this game, you shape as above but you only C&R the same behaviour 3 times. Dogs have to get super creative, be resilient to ‘failure’, solve problems, use their whole bodies, and it’s a huge mental workout. So how does this all help with agility? Let me count the ways! 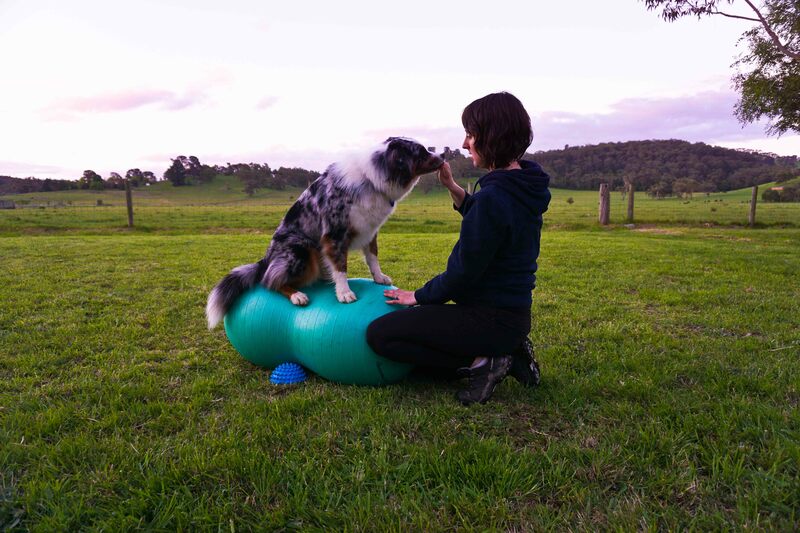 Teaches them about their bodies – feet, legs, noses, back-legs, front legs, twisting, curling in half, mouths… Agility dogs need to know how they move in space (I think this is called Proprioception) and how to use their bodies in small and intricate ways. Teaches creativity (similar to point 1). We want them to have 50 ways to solve a problem, not just 1 and for that to be “give up” or “wait for further instructions”. Teaches independence & confidence- Your dog doesn’t have to wait for you to tell it what to do, it can make its own decisions in order to get rewards, and this makes those behaviours even stronger. Builds the bond with you – I know, this seems weird since you’re not telling your dog what to do but trust me on this one. The time spent doing this with your dog is awesome. You’re celebrating his cleverness and his problem-solving, you’re a cheer-leader and a treat-dispenser, and a play-mate. You’re letting your dog use his mind and his brain and giving him a job. Once you let go of telling your dog what to do and start letting him just do stuff you’ll see that he’s so capable. Makes your dog better able to interact with ‘stuff’ (read: agility stuff). If your dog can slam a cupboard door, it can slam down a see-saw. If your dog can put its feet in a box, it can get control of its feet to hit a contact. If your dog can wrap a bollard, it can wrap a wing jump. If your dog recognises when a jackpot is a jackpot and when a non-reward is a non-reward, it will learn stuff heaps quicker. Finally, if you’ve read all this and you’re like me and a visual learner, do a quick youtube search for “puppy free shaping” and you’ll see plenty of videos of people shaping their dogs to do something using this method. If you found this helpful (or not helpful!) or have an idea for a new post, comment below! I’d love to hear from you. Preventing injuries in an agility dog. Injuries are a concern to anybody who wants to get involved in agility, so how can we make sure we minimize the chances of things happening? Look, injuries happen. A great example of this is when Lumen had had abdominal surgery a couple of months before an agility fun run. I’d been building up her stamina and wanted to take her over a couple of low jumps and in a tunnel just to get her in the ‘trial environment’. I was told I wasn’t allowed to do this as she may have still had internal stitches. Later, I took all my dogs and my friends’ dogs (with my friends) out to let the dogs have a run together. It was fairly dark at the time but something happened to my 10 year old dog while running that caused him to be unable to put weight on one of his front legs and have a limp for a few days after. My point is that the dog who may have gotten injured was fine, and my healthy dog was randomly injured. It can happen. But of course, with all the physical strain we put on our dogs when doing agility, they are more likely to be injured than pet dogs. So how can we help keep them injury free? Let’s be honest – would you like to be asked to sprint as fast as you can, turn sharply and jump over hurdles if you’re traditionally a couch potato? Probably not. A 10 minute amble around the block isn’t enough for a dog if you are asking them to do agility. I try and do at least an hour of walking/running with my dogs every day. Sometimes this is at the beach, sometimes I let them off-lead in the bush, plus they get plenty of running around full-speed together in our paddock. Of course, I’m lucky and can do this so people in more suburban environments might need to be a bit creative. I don’t necessarily agree with going to the park and throwing a ball for an hour, I think this is too hard on their joints if they’re sliding or grinding to a stop. So think about how you can get your dog walking, trotting and sprinting for a good length of time. I also swim my dogs once a week for 30 minutes at a pool and this is a great cross-training exercise. We love the beach for this reason too – plenty of swimming, but also sand-running, scrambling over the fallen trees there, and more sand running! Free running like this is the BEST. You know how people always go on and on about how important a strong core is for preventing injuries in people? Especially back injuries? The same holds true for dogs. Having a strong core means less injuries to their legs, shoulders and back. They are more balanced and more able to correct themselves as they run and jump. 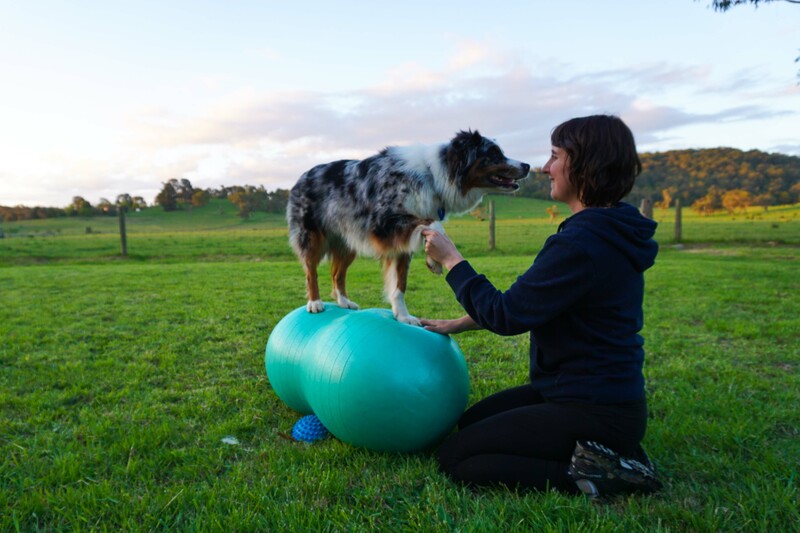 In order to develop a strong core, check back here often for Fitness Friday posts, get yourselves a Peanut (from a human store, or a dog-specific one), and/or some balance cushions, and get your dogs balancing! Here‘s an exercise to start you off! Work that core, feel the burn! But surely it’s not just the core that’s important, right? Yep! Legs, shoulders, back all need conditioning. How? Tricks. Tricks are a not-so-secret weapon in conditioning your dog. Ever done a squat? Feel the burn in your legs? Train your dog to sit pretty, then go from that position to standing on its back legs, then back to sit pretty again. Here is a hilarious video of a dog doing exactly this trick (but using the wall for help!). Sit pretty-drop-sit pretty works the back muscles, targeting with one or another leg works the other leg muscles, sit to stand works legs and hips, etc. Keep an eye on Fitness Friday for more ideas. You wouldn’t get off the couch and go for a sprint, would you? Nope. So we need to warm our dogs up, too. Your exact routine might vary by dog, for example, Lumen needs a gentle walk or jog for 5 minutes, some quick tricks and then straight into training or she becomes bored and unmotivated. Loki could probably go for a 5km run and still be ready to go flat-out when he got back. Of course I don’t do that, but he helps me set up, wanders around, plays with the ball. We might do some spins in either direction or wrap a wing multiple times to help him limber up, or sometimes we’ll get home from a 30 minute walk and train right then – he’s already warmed up from the walk. The same applies in reverse after training – a bit of a walk to cool down and maybe some stretches to follow. Since Lu injured her iliopsoas muscle, we make sure to stretch out her sides especially if she’s been bending or weaving. Usually cool down for us is pretty informal, walking around and helping pack up, Lumen likes to go check out the rabbit holes. Cool down stretches are something I need to try and practise more. Stretching individual legs forward and back, lying on the ground and ‘supermanning’, or going into ‘frog’ position are great ways to start. Lastly, something I hope I don’t have to write too much about and that is weight. If your pet is overweight and you’re making it do agility, stop. Your dog can’t run full speed if it’s carrying weight, and it’s not good for his joints. Keep your dog lean and fit, and they’ll enjoy running agility as much as you. Hopefully this gave you some pointers. As I said, keep an eye out here for specific tricks and exercises to help build your dog’s fitness, and to learn some stretches and core exercises. For today’s post, I thought I would try and answer a few quick questions that people might have about agility. Number 1, for example, is a jump. 2 is a tunnel, 3 is a ‘broad jump’ – planks of wood that make for a long jump that the dog must jump over, not on, 7 is a chute tunnel – a normal tunnel entrance with a material chute they must push through in order to exit the tunnel and 10 is a tyre jump. In this course, handlers must guide their dog from jump #1 to jump #15 in order without touching their dog. In order to qualify (gain a pass in order to move to the next class/level) dogs must finish faster than a time specified by the judge (eg. 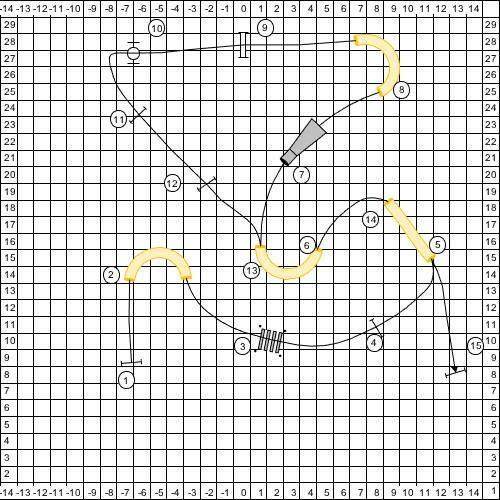 this course may have had a ‘set course time’ of 45 seconds), most not knock down any bars, must do the tunnels from the correct entry, and so on. If a dog makes a fault, they either earn fault points and are unable to qualify (but can still complete their run and possibly win a ribbon), or they earn a disqualification (but can still finish their run but cannot win any ribbons). You want your dog to get through “clear”, and with the fastest time, so your job as a handler is to make sure you’re telling and showing the dog where to go to make its path efficient and fast. I’m sure if you’ve come to this blog that you’ve seen videos or people running agility but if not, jump on YouTube and type in “Silvia Trkman” or “Justine Davenport” or “Lisa Frick”. Sounds great! How to I find a club or classes? Well, in Victoria at present, this is a little tricky. Over on the Eastern side of the city, the agility-specific clubs are closed to new members. The writer of this blog has been waiting 2 years to get into one or the other of the clubs. There are a few clubs in other parts of the city, and probably your best bet is to have a look at this site which is an absolutely fantastic resource with the rules, trials you can enter (once your dog is trained, of course), a list of clubs, and plenty of other information. 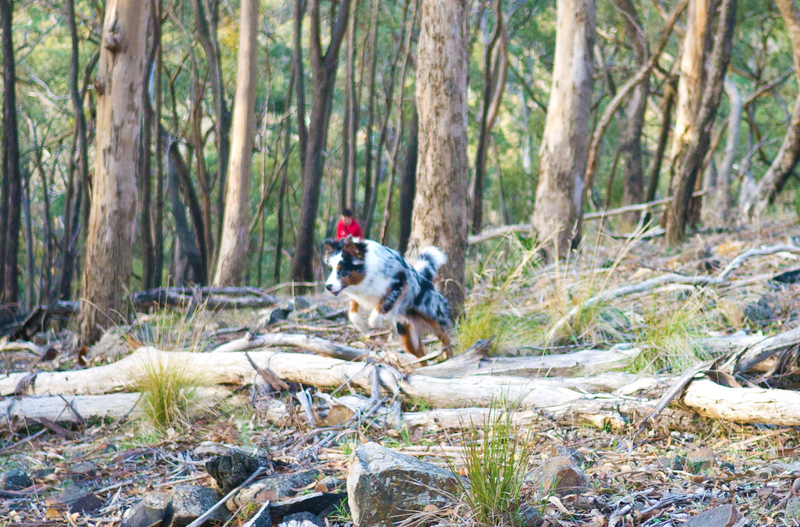 There are also a couple of people running their own classes – Mountain Agility Dogs being one of them. Some obedience clubs in Victoria require your dog to be at a certain level of obedience before being able to start agility, so you may not find this suits you. 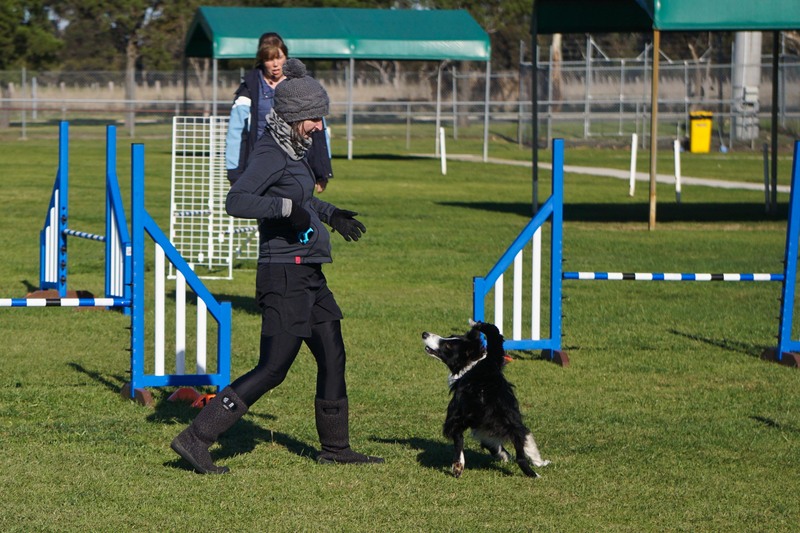 If you’re here visiting from Interstate you can probably type in “agility trials (state)” and find a site similar to the one I referenced above to help find clubs in your area. I have a young puppy, when can I start agility? There is a LOT of debate over this one and I don’t necessarily think anybody knows for sure, however everyone is pretty convinced that their view is the correct one! Personally, I think you can start training puppies from the day you bring them home. Does this mean jumping them? No. It means doing tricks with them to teach them how to learn and how to use their bodies. It means doing tricks that later, begin to look a lot like agility… I start jumping my puppies at 6-8 months on a very low height. I don’t do hundreds of reps, and I don’t train every day. I think that using a bar helps teach them to respect the bar and to start thinking about the process of jumping. I keep my dogs fit and lean, and I work on their core, legs and back muscles through tricks and stability exercises. I think it could be worse for a dog if they are left to do nothing until they’re a year old and then suddenly forced to jump their full height. Interestingly, a lot of European trainers would be jumping their dogs on full height by 18 months (as we do here), keeping in mind that their heights are much higher than in Australia. A dog Lumen or Loki’s size would be jumping 650mm in Europe, where they only jump 500mm here, so I would assume those dogs would be working through our heights quicker than our dogs do. 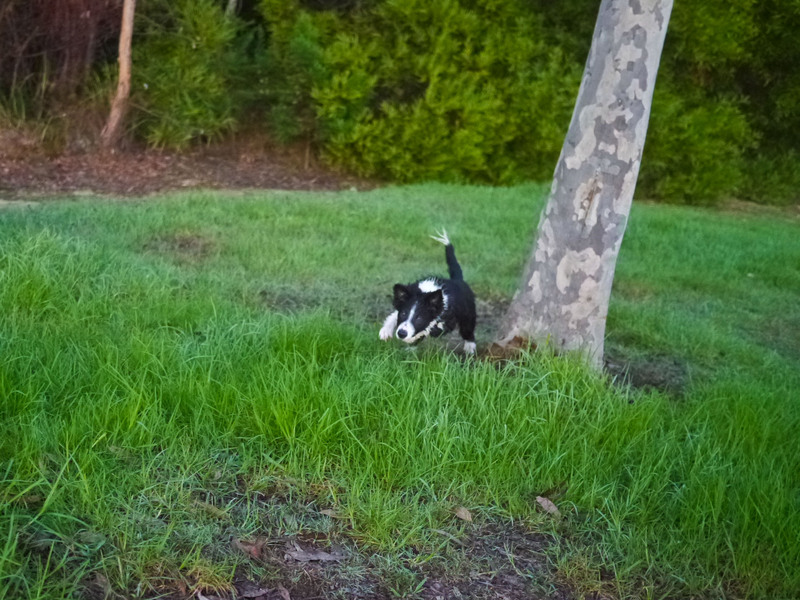 There is plenty you can do with a puppy that will get him ready for agility. The more socialization you do with strange surfaces, being on, in or going through something, the better equipped he’ll be when faced with his first chute tunnel. Are there different types of agility? 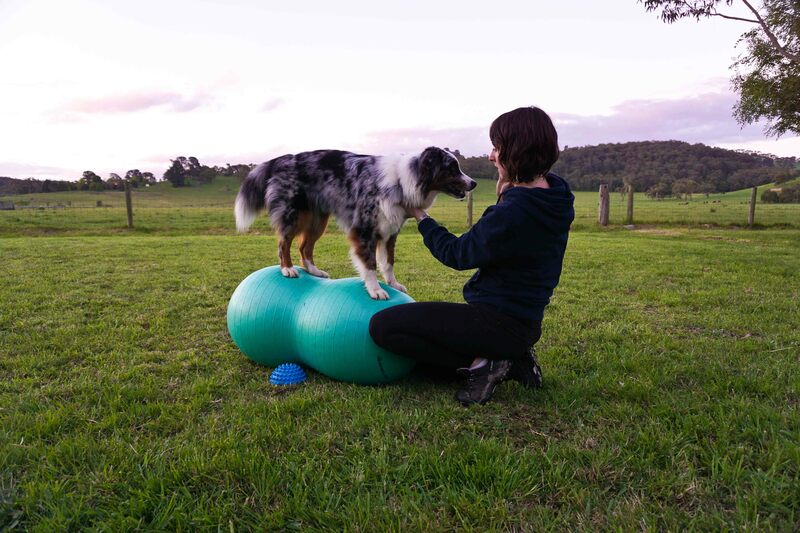 In Australia there are currently 3 ‘brands’ of agility: ANKC (Australian National Kennel Council) – is the main and most popular form. It consists of Jumping (jumps and tunnels) and Agility (jumps and tunnels, plus weave poles and contact obstacles) and the levels go from Novice, to Excellent, to Masters, and also includes ‘Open’, which is open to any competitor from any level and includes a distance challenge. There are also games which are offered less often, and these are Snooker, Gamblers and Strategic Pairs. You can also find clubs which train and hold trials in NADAC. I’m not familiar with this form, however I understand they have some different kinds of competitions, for example ‘Tunnelers’ with just tunnels, and hoopers – where jumps are substituted by hoops. 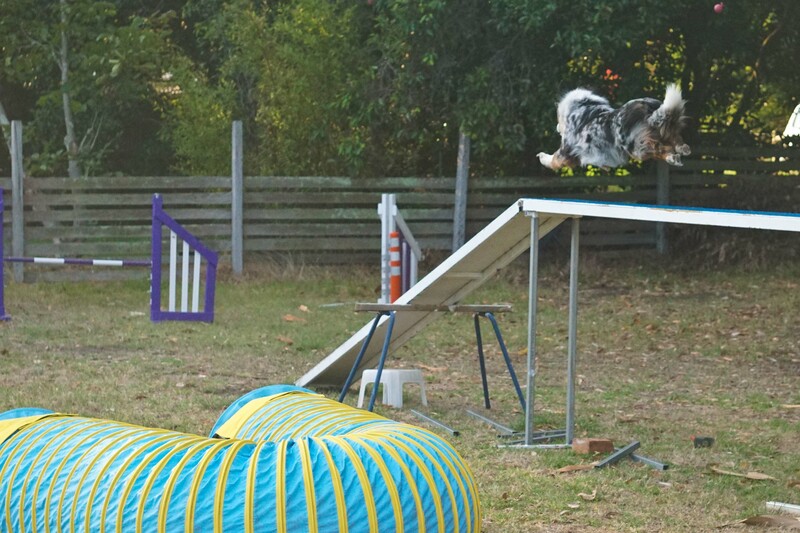 There is also ADAA – Agility Dog Association of Australia – which currently only runs in NSW and QLD. I think it may be similar to ANKC but since we don’t have it in Victoria I haven’t really looked into the differences or learnt about it. That’s enough questions for now. When I have some more, I’ll post part 2. Every Friday I’ll put some exercises and tricks here that will help your dog get fit and conditioned for agility (as part of a wider conditioning program, regular walks and runs, etc). Obviously if your dog has any injuries or issues, consult with a vet or rehab specialist before doing any of these exercises. Today’s exercise is another really simple one that you can do with no equipment, can start really easy and build up to much harder. It’s a simple sit to stand! The trick with this one is to make sure the front feet don’t move around when the dog stands up. This way all those nice juicy back-leg muscles get a great workout. This exercise is also great for working the muscles around the hip without putting stress on the hip joint. You can start with this just on the flat, getting your dog to sit, and then luring into a stand (or use a verbal stand command if you have one). Reward, then sit, reward, stand, reward. You can do this 10 times, or as many as you like assuming your dog isn’t showing signs of fatigue. Once your dog is pretty pro at doing this on the flat, you could either take it onto a couch cushion, balance cushions or a peanut. You can start with the peanut pushed up against a couch and held in place by your body if your dog is just starting. Later, you can have it ‘freer’, by being kept still by paw pods or a cushion or two and a light hand rested on top.